At the 1997 Golden Dawn Conference in London, a unique and enigmatic set of Enochian Tablets were displayed to the public for the first time. These tablets, once owned by Dr. William Wynn Westcott, were discovered a few years back in the archives of the SRIA, but there was no documentation to explain why they were made, or why they were so different from all other Golden Dawn Elemental Tablets. Not long after that conference, I had the opportunity to study these Tablets at length, making it my duty to document everything about these Tablets for future research. 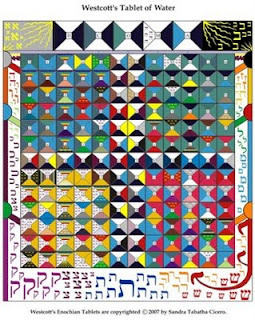 Additionally, the Tree of Life is painted on the individual canvases in such a way that only half of each sephirah is shown, since they "run off" the sides of the canvas. The Tree of Life is actually reversed in two of the Tablets. The Fire and Earth Tablets show the Tree as it is normally viewed—with Chokmah, Chesed, and Netzach on the right, and Binah, Geburah, and Hod on the left. However, the Water and Air Tablets have Chokmah, Chesed, and Netzach on the left, and Binah, Geburah, and Hod on the right. It would seem that the four Enochian Tablets are meant to be used as a representation of a three-dimensional Tree of Life which encompasses the Four Qabalistic Worlds. And this is perhaps why Westcott’s Enochian Tablets are the only Enochian Tablets that fully utilize all four Color Scales of the Golden Dawn. More info can be found in Volume 4, issue 4 of Hermetic Virtues Magazine.